In the winter of 2017/2018, Eurowings had the largest number of low-cost flights to and from Germany, with a market share of more than 50 percent. The average gross price of a one-way flight from Germany with a low-cost carrier ranged between 53 and 117 euro. The previous year’s figure was approximately 44 to 105 euro. A large majority of the routes are still served by just one provider. The number of low-cost flights from Germany, from Europe and overseas has increased again. Approximately 30 percent of all flights from Germany are now operated by low-cost airlines. After the insolvency of Air Berlin and the redistribution of its routes, a new record has been set for the number of low-cost flights from Germany over the winter period. Eurowings, easyJet and Ryanair dominated this growth. Eurowings and Norwegian are increasingly serving low-cost destinations outside Europe. Retail prices are rising again, but mostly only moderately. At the same time, the pan-European low-cost airfare market showed a considerable increase of more than 10 percent. These are the results of the 'Low Cost Monitor 1/2018' recently published by the German Aerospace Center (Deutsches Zentrum für Luft- und Raumfahrt; DLR). This report has been published every spring and autumn since 2006. 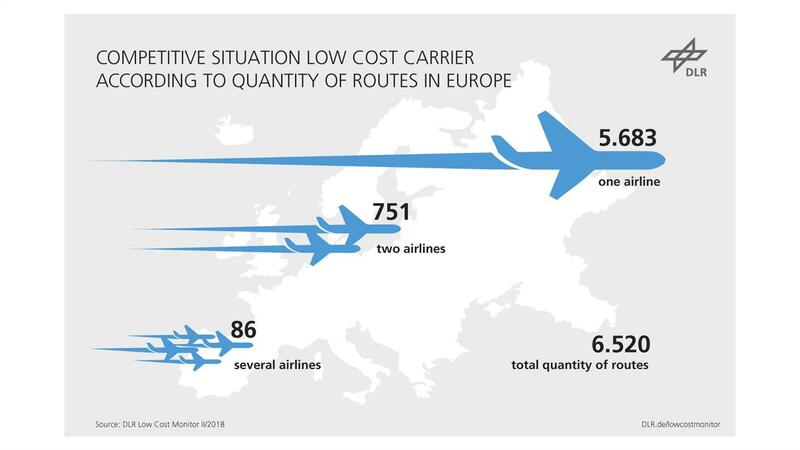 "The route networks of low-cost carriers from Germany set a new record during the winter period, with 642 different routes, compared to 518 last year," says Peter Berster from the DLR Institute of Air Transport and Airport Research in Cologne. "The biggest route network expansion was by Ryanair, with an additional 59 services, up by 35 percent. easyJet also enlarged its network, serving 14 new destinations." Eurowings' 40 percent year-on-year growth is clearly dominated by its acquisition of numerous Air Berlin routes. It had the largest number of low-cost flights to and from Germany during the winter of 2017/2018, with a market share of more than 50 percent. This was followed by Ryanair with an 18.2 percent share and easyJet with 16.7 percent of available flights. "easyJet doubled its services in the course of acquiring Air Berlin routes and now operates approximately 400 more flights than last year,” adds Berster. 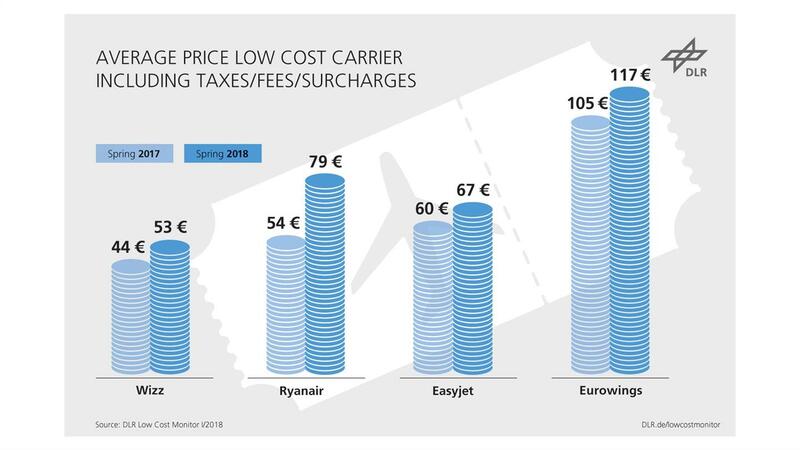 Rising oil prices and the increased expansion of low-cost airlines at major airports are resulting in low-cost carriers raising the average gross price of a one-way flight to a range of between 53 and 117 euro, in the case of those airlines offering low-cost fares. Last year, the figure for these airlines was approximately 44 to 105 euro. "This shows that prices have risen more moderately than initially expected at the start of the winter schedule," according to Berster. "The additional takeover of Air Berlin routes by easyJet and the many routes acquired by Eurowings have had a dampening effect on prices." The quoted price range summarises the average gross airfare for a representative selection of routes for Germany's main low-cost airlines, namely Eurowings, Ryanair, easyJet and Wizz. The average prices in the Low Cost Monitor are determined based on various advance booking periods, ranging from one day to three months. The arrival of Ryanair and Wizz at Frankfurt Airport has further increased the number of low-cost flights at Germany's largest airport. With a nearly five percent low-cost share of total volume, however, this ratio is still far below the values found at other European hubs. Amsterdam and Madrid, for example, have values of around 20 percent. At Dusseldorf Airport, Eurowings has expanded its services by more than 50 percent, due to the demise of Air Berlin, and now also operates long-haul flights from there to the Caribbean. Throughout Europe, Barcelona, Dublin and London Gatwick airports have the largest number of low-cost services. Across Europe, Ryanair and easyJet continue to lead the low-cost carriers. Ryanair now offers 2395 services on the continent, followed by easyJet with just under 1200 routes. Together, these two airlines account for almost 50 percent of all low-cost flights in Europe, with 27 percent attributable to the market leader, Ryanair. 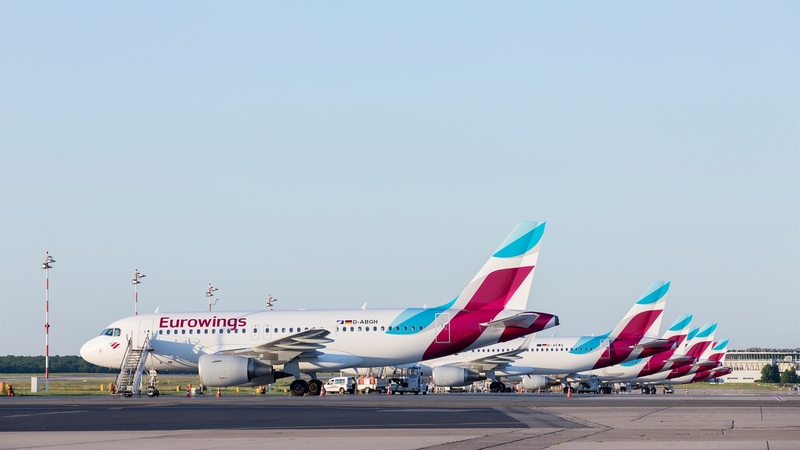 Eurowings increased its share of the European low-cost market from seven percent of flights last year to today’s nine percent. 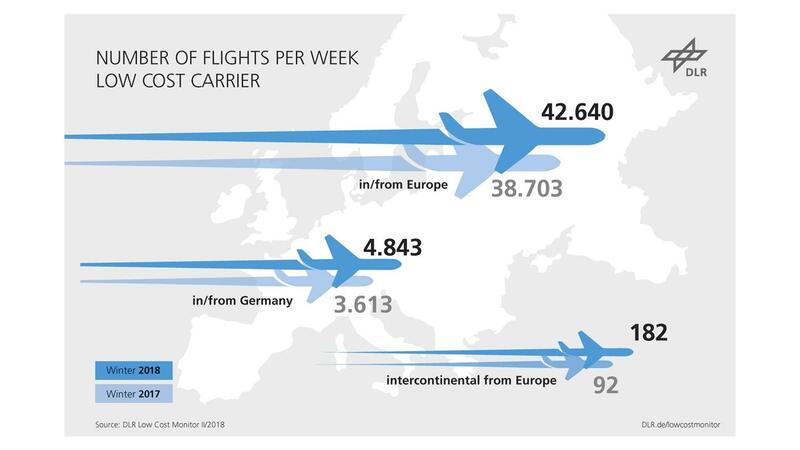 Overall, low-cost air traffic in Europe has again risen significantly, by more than 10 percent compared to last year. In order to handle this service expansion, a correspondingly large number of suitable aircraft is required. For the most part, these are Boeing 737 and Airbus A320 type aircraft. For example, Ryanair now has a standardised fleet of over 430 Boeing 737 aircraft, each with 189 seats. This represents an increase of 18 percent compared to last year. Norwegian has also greatly expanded its dedicated fleet. As well as approximately 120 Boeing 737 aircraft, the fleet also includes 20 of the modern long-haul Boeing 787 models that are used for intercontinental destinations in Asia and America. The deployment of six new Boeing 737 Max 8 models also allows it to operate lower-volume intercontinental services from smaller airports, such as from Edinburgh to Newburgh in the USA. Airlines often design their low-cost services very differently. Only a few clear differentiation criteria can therefore be defined for the low-cost market segment – for example, a low price and general availability or direct sales via the Internet. Airlines are tending to merge their business models more and more. While Ryanair is now increasingly operating at major airports and attempting to attract premium customers by selling add-on services, charter carriers and established airlines are increasingly entering the low-cost market via subsidiaries or with their own offerings. In Germany, Lufthansa has transferred its domestic and European flights to its Eurowings subsidiary, except for those to and from its Frankfurt and Munich hubs. The results of the study are based on data from a reference week in January 2018.